CANBERRA, Australia (AP) — The chairman of the Australian Broadcasting Corp. resigned on Thursday over allegations that he pressured the independent national broadcaster to fire two political journalists because the ruling conservative government disliked them. The scandal has damaged the credibility of both the governing coalition and the ABC, which is government-funded but is required by law to operate independently of party politics. The ABC is many Australians’ most trusted news source. ABC chairman Justin Milne announced on Monday that ABC managing director Michelle Guthrie, who is also the broadcaster’s editor-in-chief, had been fired halfway through her five-year contract because the board did not like her leadership style. “It’s clearly not a good thing for everybody to be trying to do their job with this kind of fire storm going on, so I wanted to provide a release valve,” Milne told the ABC in a television interview. Milne said his resignation was “absolutely, 100 percent not” an admission that he had failed to safeguard the ABC’s editorial independence. 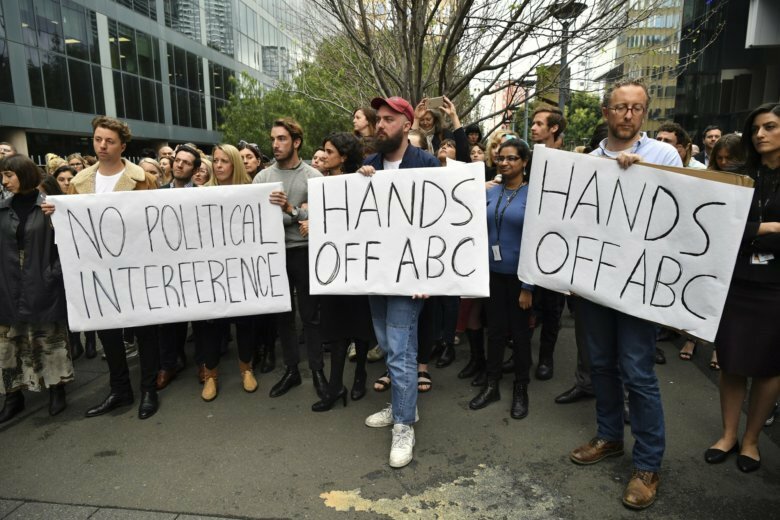 “There was absolutely no interference in the independence of the ABC by the government. Nobody from the government has ever rung me and told me what to do in relation to the ABC. Nobody ever told me to hire anybody, fire anybody or do anything else,” Milne said. Fairfax Media has reported that Milne wrote an email to Guthrie calling for Alberici be fired on May 8, a day after Turnbull complained to the ABC’s news director about an Alberici report on government spending. “They (the government) hate her,” Milne reportedly wrote to Guthrie. “Get rid of her. We need to save the ABC — not Emma,” he added. Turnbull, who has lived in New York since he was ousted as prime minister on Aug. 24, said on Thursday that while he had complained about the two reporters’ journalism, he had never asked for them to be fired. “The bottom line is I’ve never called for anybody to be fired. My concern has been on the accuracy and impartiality of reporting,” Turnbull told reporters. The government on Wednesday ordered a communications department investigation into the published allegations that Milne had pressured Guthrie to fire the two journalists, warning she was “putting the future of the ABC at risk” and jeopardizing 500 million Australian dollars (360 million) in government funding the chairman wanted for his pet project to digitize the broadcaster. The minor Greens Party has called for a Senate inquiry into the entire ABC board, not trusting a government inquiry into the government’s potential involvement in the scandal. Prime Minister Scott Morrison tweeted that Milne’s resignation was the right decision. “The idea that the government has somehow got some list and is telling the ABC who should work there and who shouldn’t — that’s complete rubbish,” Morrison told reporters.